This is an advertisement for G. F. Cotton's drapers store in London. 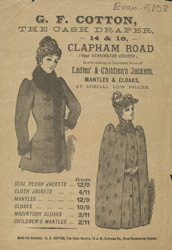 Drapers shops, like the one featured in this advert, were enchanting places in the 19th Century. The different materials, calicoes, linens, silks and muslins, were stacked in large rolls on shelves around the rooms for customers to look at. The more exclusive stores were lit by gas chandeliers to ensure that the materials shone enticingly, and store assistants were charming and persuasive.